In the Leekes Sale. We have picked out our key special offer items. Shop below and make sure you don't miss out on our great savings! With a proud history dating back to 1897 when it began as a blacksmith and ironmongers, Leekes has evolved into a thriving online retailer - via its leekes.co.uk site - and a growing UK department store chain following a number of recent store openings. A classic brand closely associated with quality, none too dissimilar to John Lewis, it remains a family business and specialises in furniture, kitchenware, electrical goods, home accessories, home improvement products, garden goods and fitness equipment. Its slogan - You're Home - neatly encapsulates its position as a provider of everything one could need to create the perfect home and garden. 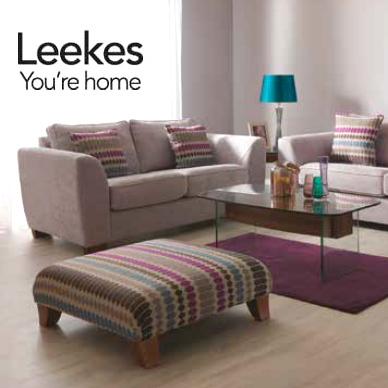 Add Leekes to your Favourites list and be the first to know every time they have a Sale on! 1st January 2018 - Leekes New Years Day sales for 2018. 7th May 2018 - Leekes Early May Bank Holiday sales for 2018, add to your diary now! July 2018 - Leekes Summer 2018 sales, joining us? 23rd November 2018 - Leekes Black Friday sales in 2018 start on Friday 24th November. Add products from Leekes to your Love Sales list. Get the Love Sales button now! In the Leekes January Sale. We have picked out our key special offer items. Shop below and make sure you don't miss out on our great savings! In the Leekes Boxing day Sale We have picked out our key special offer items. Shop below and make sure you don't miss out on our great savings! In the Leekes Christmas Sale We have picked out our key special offer items. Shop below and make sure you don't miss out on our great savings! In the Leekes Cyber Monday Event, We have picked out our key special offer items. Shop below and make sure you don't miss out on our great savings! In the Leekes Black Friday Event, We have picked out our key special offer items. Shop below and make sure you don't miss out on our great savings!